They say when something appears 3 times it’s a clear message from Spirit and so this past fortnight has been all about acknowledging the loving energy of Isis. This energy has been building for several weeks, since the Day of Mary Magdalene on 22 July. Mary Magdalene is thought by many to carry the energy of Isis, a later incarnation of the original goddess and Great Mother of Earth. Isis, of course was the Ancient Egyptian sister and lover of Osiris and together they embodied the divine feminine and masculine energies of Christ Consciousness, pulling the energies in from their spiritual homeland of Sirius and leading the example for all humanity in how to embody and anchor the frequencies for ourselves. These energies are again streaming in through the opening of the Sirian star gate, the Lion’s Gate, which peaks this weekend on 8.8. The Lion’s Gate occurs when the Sirius star system aligns with our Sun, allowing these higher energy frequencies to be transferred through our Sun’s rays to help raise our vibration and expand the consciousness of all who wish to connect and pull the energies in for their own evolution and expansion. This year, we experience the magic of the triple 8, (8.8.2015/8), the number of structure and manifestation, giving greater potency to the energy and the transformation it brings. 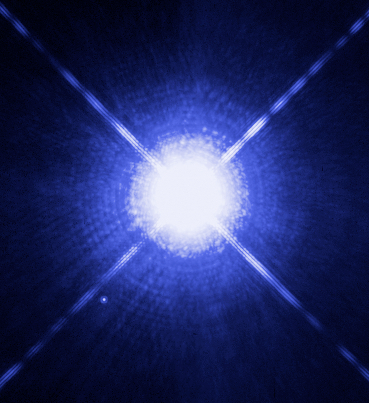 Sirius is known as the blue star, a binary star system with the larger white lighted Sirius A and it’s orbiting smaller blue star, Sirius B, forming the brightest star in our night sky. The Sirians themselves are an advanced 6th dimensional civilization, master teachers with a long benevolent history with our planet that continues through many life forms here including the Great Whales and Dolphins beings. Through the high frequency Light of this powerful portal, they have called and I sense them beckoning from a place of Love and Purpose, with a blissful opportunity to witness through my own meditation what I’ve come to understand as the blue star energy of Isis. Isis, the original high priestess of magic, is here and calling on those who resonate to engage and behold, guiding us to advance our own evolution through the gifts we have come here to share. Embracing the Divine Love flooding in will clear The Way for new beginnings and show us the true essence of the power we all hold within. It will bring us closer to our Divine Purpose, allowing us to merge with more of our spiritual Light, the sacred Light that supports all life. It will bring us closer to the true energy that fills us, that guides us, that is us. It will bring clarity and reason, joy and expansion and freedom to be in whatever form supports the expression of our highest way of being.